The Kansas City Symphony presents “Mozart, Beethoven and Haydn” featuring guest conductor Bernard Labadie and guest pianist Robert Levin on Nov. 25-27 in Helzberg Hall at the Kauffman Center for the Performing Arts. The program includes two Mozart overtures from Don Giovanni and La clemenza di Tito, as well as Beethoven’s Third Piano Concerto and Haydn’s Symphony No. 98. Tickets from $25. Call the Box Office at (816) 471-0400 or select your seat here. Tell us about the program for the Nov. 18-20 Kansas City Symphony concerts. The program explores both the dark and bright sides of the late Classical/early Romantic repertoire. The overture to Don Giovanni opens with the vivid description of hell, which later returns to haunt the main character at the end of the opera. Beethoven’s Third Piano Concerto is a profound and compelling reflection on the conflicting emotions of human life, from the stark and menacing beginning to the deep and poignant lyricism of the slow movement. In contrast, the overture to La Clemenza di Tito and Haydn’s Symphony No. 98 celebrate life with radiant — and even witty — jubilation. These concerts fall immediately after the Thanksgiving holiday, which is centered around food and family gatherings — and we think music should be part of that set too. What are you thankful for this year? The answer is easy: I’m just thankful for being alive. Two and a half years ago I was diagnosed with a severe form of lymphoma, which brought me through a very long journey of suffering, anxiety, sadness, resilience and slow rebirth. Only this fall have I resumed my conducting career at full speed. Making music has never been so joyful and so meaningful. Life is a great and beautiful thing, and one should never take it for granted. Since you’re returning to the Kauffman Center for the Performing Arts to once again lead the Kansas City Symphony, how do you describe the auditory experience of performing in Helzberg Hall? How does it compare to other halls, in your opinion? There is no doubt in my mind that Helzberg Hall has world-class acoustics comparable to the best concert venues both in North America and Europe. The listener feels very close to the music and the musicians, and everyone is engulfed in a wonderful and sensuous sonic experience. The sound is at the same time very warm, extremely detailed and clear. 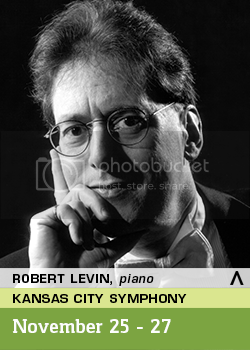 Tell us about pianist Robert Levin. How long have you two known each other? What special qualities does he bring to the stage as a performer? I have known Robert for 25 years, first as a conducting student while he was performing at the Bachakademie in Stuttgart in 1991. We have performed numerous times together ever since, and I view every single encounter with him as a fabulous privilege. Robert is much more than just a great pianist, musician or musicologist (he is all three at the same time). He is one of those extremely rare individuals whose understanding of music allows them to absorb and recreate the complexity and richness of the great geniuses’ music to their full extent. His capacity to improvise ornaments and cadenzas live on stage in late Classical repertoire, like Mozart and Beethoven concertos, is second to none. He is a leading authority on performance practice, and his work on Mozart’s unfinished works is simply remarkable. The only version of Mozart’s Requiem I ever conduct nowadays is the brilliant completion he published in the early ‘90s. Robert is truly one of the greatest treasures of American music, and it is a privilege to be able to call him a friend. Believe in you, work hard, stay humble in the face of music and colleagues, and yet pursue your goals with determination and passion. Music is an amazing gift and must always be treated with utmost respect. What are other upcoming highlights for you this season? This season is really full of exciting challenges for me. Among others, I will return to the New York and the Los Angeles philharmonics, the St. Louis Symphony and the Bavarian State Radio Orchestra in Munich. I also will have my debut with the Canadian Opera Company in Toronto (with one of my favorite operas: Mozart’s Magic Flute) next January, as well as first appearances in Oslo and Vienna (at long last!). And, of course, I have more projects with the two groups I founded in Quebec City, the Les Violons du Roy and La Chapelle de Québec. I used to walk a lot before my illness, and I can’t wait to have entirely rebuilt my muscular strength so that I can go back to it regularly. My girlfriend has introduced me to fishing last summer and I loved it! When I travel, I always try to save some time for discovering the many wonderful places I’m privileged to visit… especially if there is a vineyard in the neighborhood! Returning to the Kansas City Symphony is one of the joys of my year. The orchestra is fabulous, the management and whole organization are world-class, and the audience always vibrant and knowledgeable. Can’t hope for more!